department of recreation & parks operates 27 different activity centers all around los angeles. pan pasific activity center is one of them, but due to economical reasons it has been out of service. the center used to offer various events for the seniors such as fitness classes, arts and crafts, language lessons, oil painting and dancing etc. but since the funding for several classes have been cut, the building and its surroundings seem to have a deserted feeling. just like the pacific design center in west hollywood and pan-pacific auditorium on beverly boulevard, pan pasific activity center contains two main colors: green and red. these distinctive tones combined with white lines distinguishes the structure from the other ones around. michael heizer is an american contemporary artist started creating large-scale sculptures and land art in the late 1960s. in 2006, he ran into a giant piece of rock (340 tons) at a stone valley quarry in riverside county california. 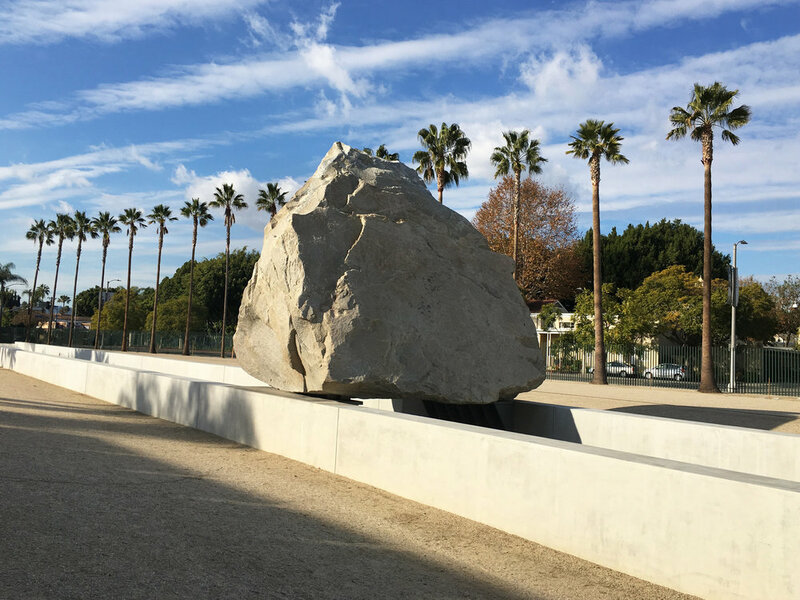 the transportation of the boulder to lacma took 11 days and the cost of the whole project reached up to $10 million. the huge vehicle carrying the boulder passed four counties and 22 cities—trees were cut down, cars were towed and some of the traffic lights were removed to help the transporter move. hundreds of people were waiting to see the installation arriving and the journey took more attention than the artwork itself. heizer never gave a public speech about his work but he emphasized the importance of the size and its longevity which is meant to last about 3.500 years. in 2015, french installation artist vincent lamouroux was commissioned by “please do not enter” to cover a forgotten landmark in los angeles all in white. 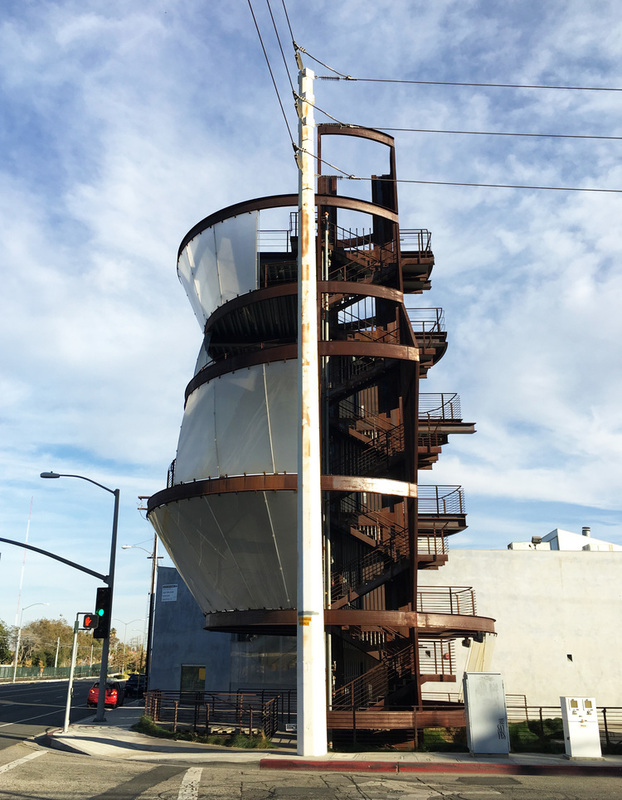 for projection la, he sprayed the whole structure with ecologically safe white paint—from the trees surrounding it to the windows, from the signboards to the stairs. white has been chosen as the main color to create a disappearing, ghostly look. the purpose was to draw attention to the demolition of the hotel which is soon to be turned into a mixed-use space for retailers, parking lots and restaurants. “please do not enter” is a well-known retail store and a cultural destination curating events, contemporary art projects and public installations. their “please do not enter” logo was placed on the white surface, creating a conflicting effect by looking like a “no entry” sign for the ones who don’t know about the team and the idea behind the project. paul smith’s los angeles store has been one of the landmarks of the city since 10 years. located on melrose avenue, this pink box is inspired by the works of mexican architect luis barragan. 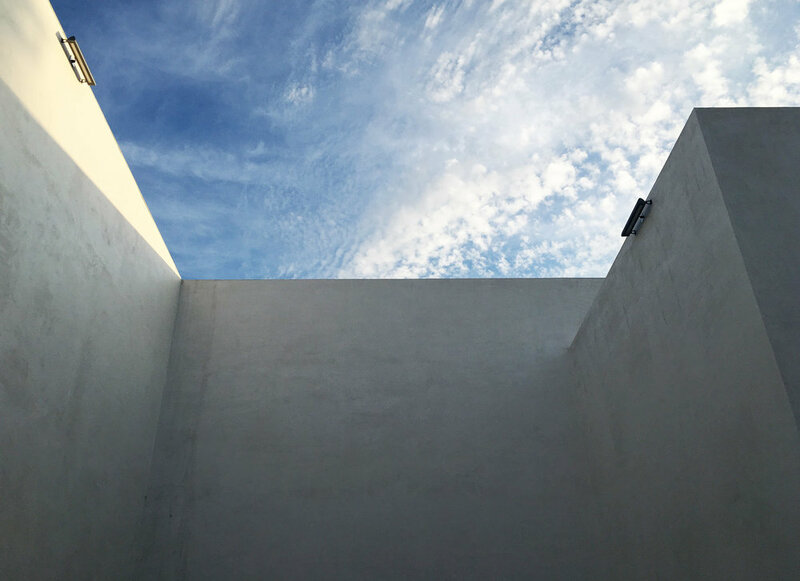 his architecture focuses on clear forms, live colors, shadow plays and geometric textures. with its pink, solid and attractive color, the building is a meeting point, famous spot both for tourists and locals to take pictures and a reference point while giving directions. In architecture, urban space Tags how important the color is? 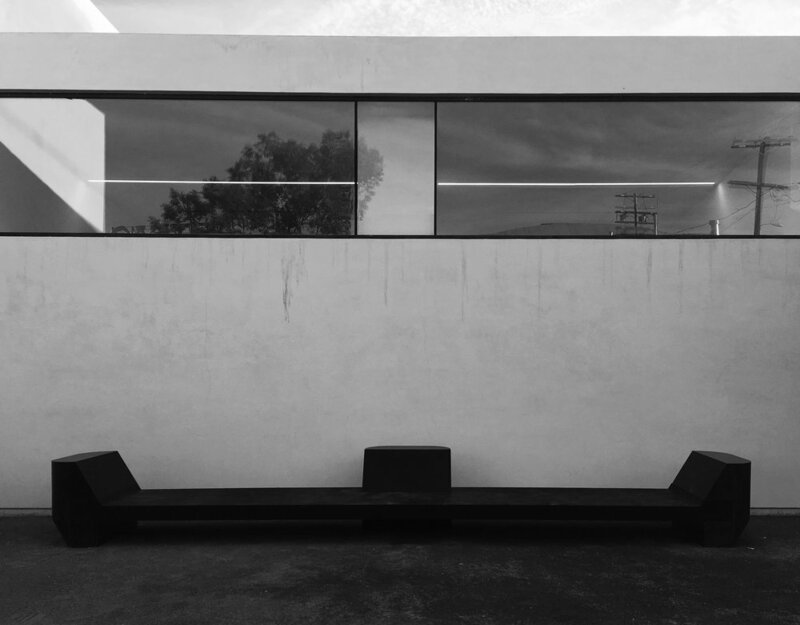 the first store of rick owens in los angeles has minimal lines that still reflects the traditional style of californian architecture—one from many other. california-born rick owens is a fashion designer, but he has been working on the architecture and interior design of his stores together with the architect anna tumaini. 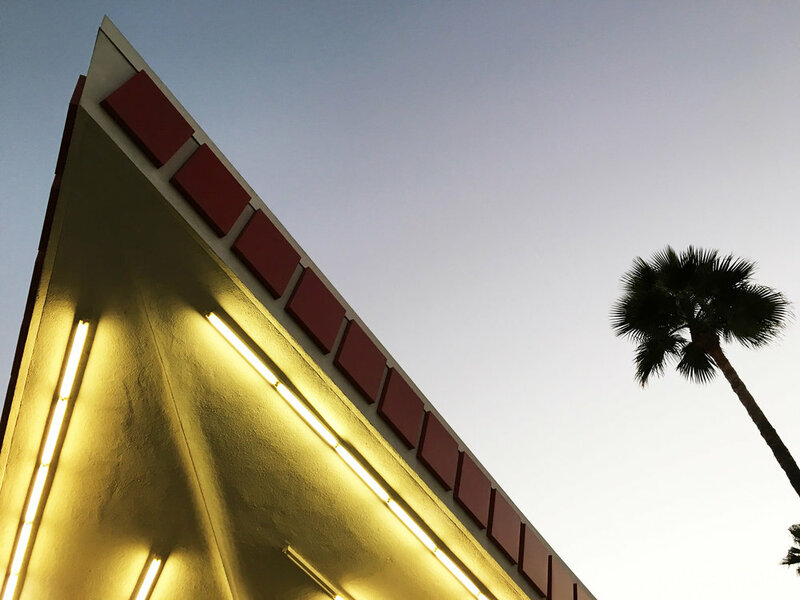 for the latest store located in la brea, they combined different fields—architecture, fashion and cinema. the design is a homage to american filmmaker cecil b demille and every detail is arranged as he could have used the space as his set. 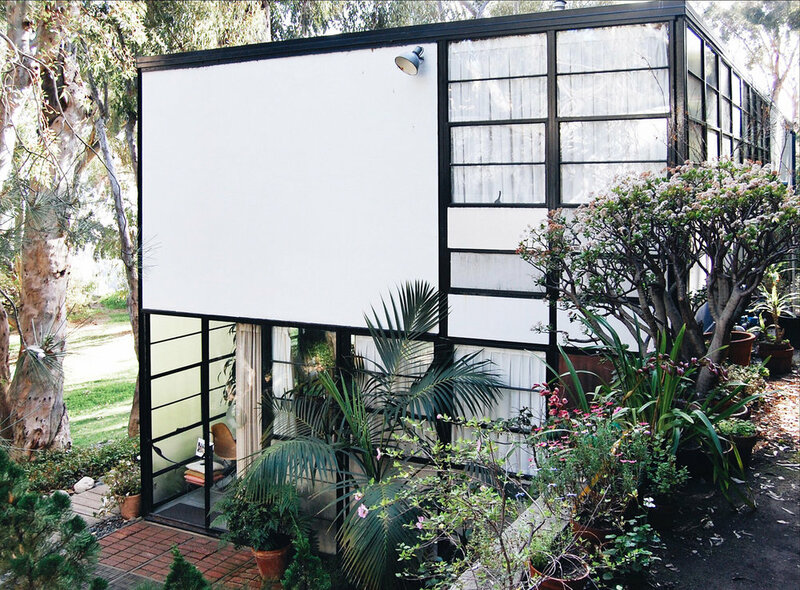 the wide, white wall hiding the structure from the main street gets inspiration from movie screens and reflects shiny californian sunlight into the courtyard. 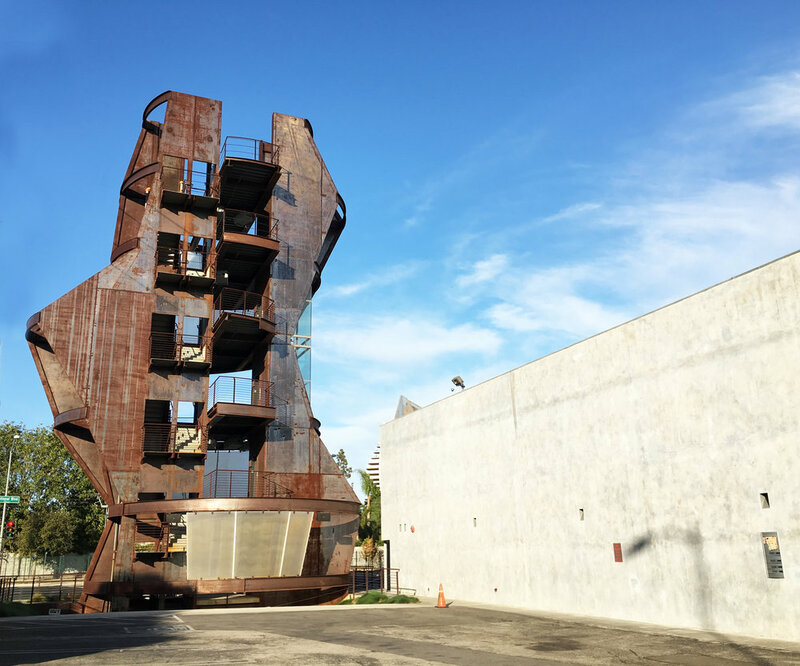 "cradle" installation was assembled in 2010 to the façade of a parking structure designed by frank gehry. los angeles based practise ball-nogues’s huge structure measures around 11 meters wide and 10 meters height. the studio merging the practises like architecture, art and industrial design is famous with their public installations that creates physical engagements. 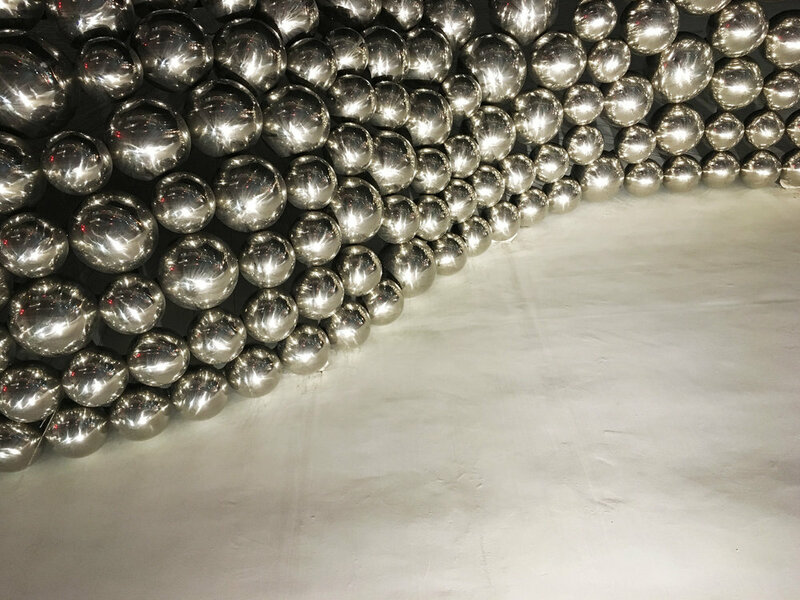 “cradle" consists mirror polished spheres placed side by side to hold each other and gets its inspiration from the famous toy—newton's cradle. 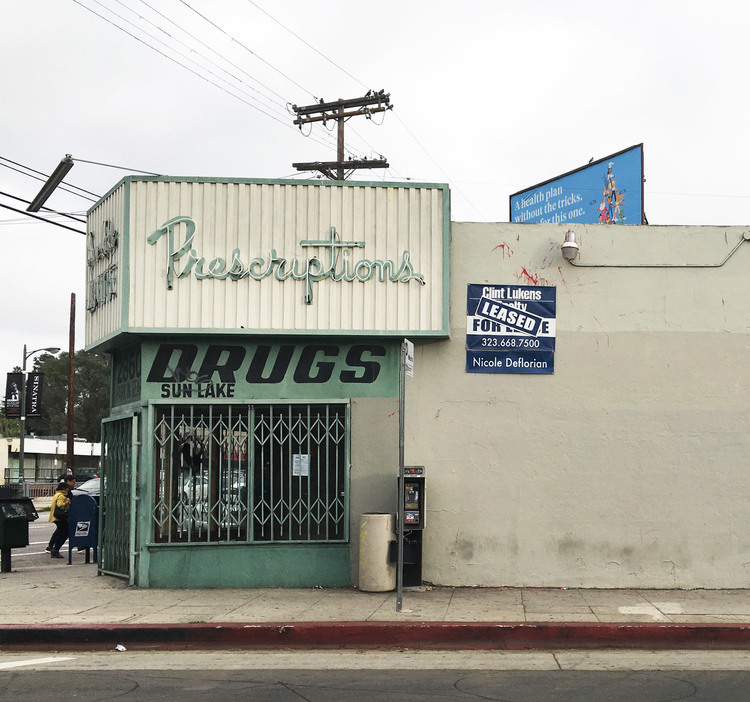 sun lake drugs is an 100 years old pharmacy located at the intersection of sunset and silver lake boulevards—one of the most central points of los angeles. the other day, after a car went through the window of the pharmacy, city hall had the excuse to drove it out of business. but the rising rents along sunset boulevard and stiff competition from much larger chain stores are the covered reasons lying behind this operation, which means that this is the end of an era for silver lake neighborhood. sun lake drugs, the pharmacy giving cheaper and wider options to the locals, has been also a part of the citywide installation project "richard artschwager!”. richard artschwager’s “blps”— the pill shaped black marks in the forms of sculptures, paintings, photographs or prints — were born in 60’s, and he placed them all the “unnoticed” places in the cities from streets to buildings, subways to stairwells. after his death in 2013, hammer museum and LAND presented an exhibition in the name of artschwager’s "blps", and selected a number of sites throughout los angeles to paste printed "blps"— from union station to santa monica pier, from venice skate park to sun lake drugs. 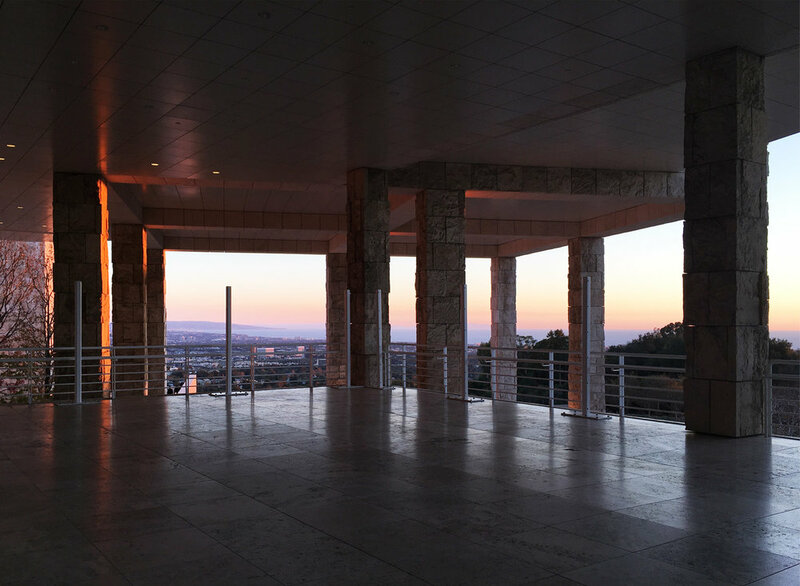 getty museum is designed in 1997 by the architect richard meier who uses “white” as his signature. meier says “i’d never live in a non-white interior.” but in his architecture, white actually has a pretty wide range. 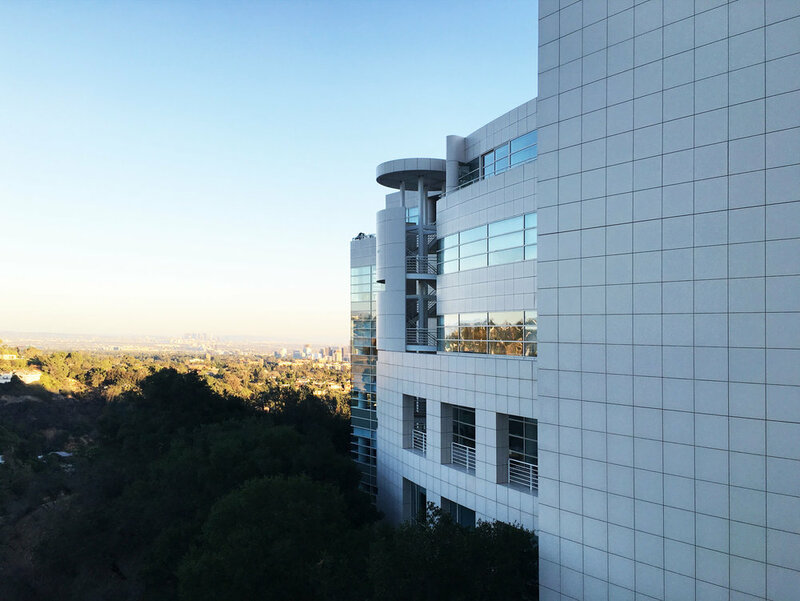 for example the getty center consists 6 white buildings and since the ones on the edge gets the sunlight easier than the others, their façades have a matte tone of white—so that all the buildings can look in the same color. the skin of all the buildings, the tiles on the floors, and even the shapes of the trees are composed of 30-inch square panels because this ratio is defined as the general comfort zone of a person. getty museum looks all white and simple but its floor plan is pretty complex and tilting. 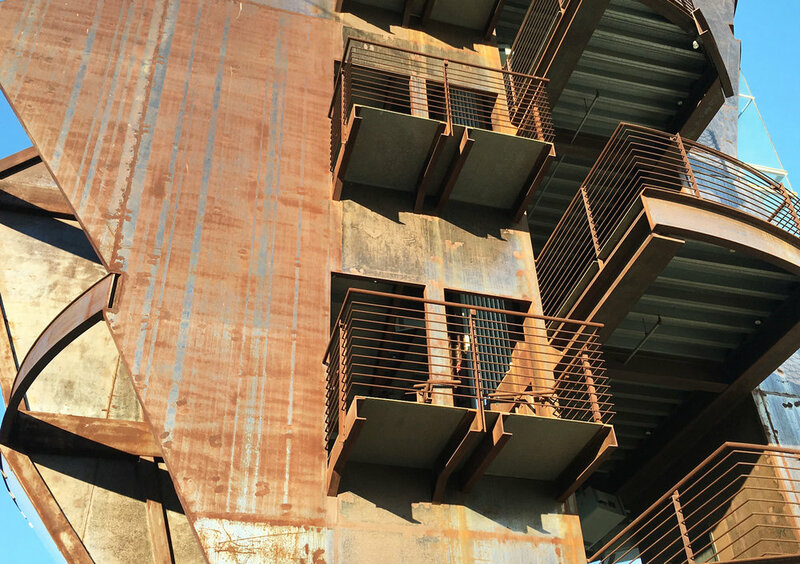 this form is based two elements: the topographic orientation of the site and the relationship with the route of the freeway which connects los angeles to san diego. schindler house has a plan formed by 3 “L” shapes with an intersection point. one for the architect schindler and his wife emilie, one for the engineer chace and his wife marian and one for the guests. each couple has two rooms (one for each as working spaces), an outdoor bedroom on the roof and a garden as the living room on the front. so every detail of the house was conceived to be living within the nature. but schindler designed it in 1992 when there was no settlement around. could he make the same radical decisions if he would have designed it today?